On Saturday, May 11th, educators from across Ireland and beyond will gather at LIT in Thurles, County Tipperary for the annual ICT in Education conference. As described by its organiser, Pam O’Brien, it is a conference “by teachers, for teachers”, and that includes teachers in the broadest sense — primary, secondary and third levels, adult and community education, and beyond. The theme of this year’s conference is “Student Voices”. The wonderful Grainne Conole will be a keynote speaker, sharing her considerable expertise by speaking about learning design and promoting new pedagogies. Grainne also will offer a Learning Design Workshop on Friday, May 10th. A CESI Meet will be held on that Friday evening as well. All of these events can be booked on the ICT in Education website. This year, I was delighted and honoured to be invited to give a keynote at the conference as well. 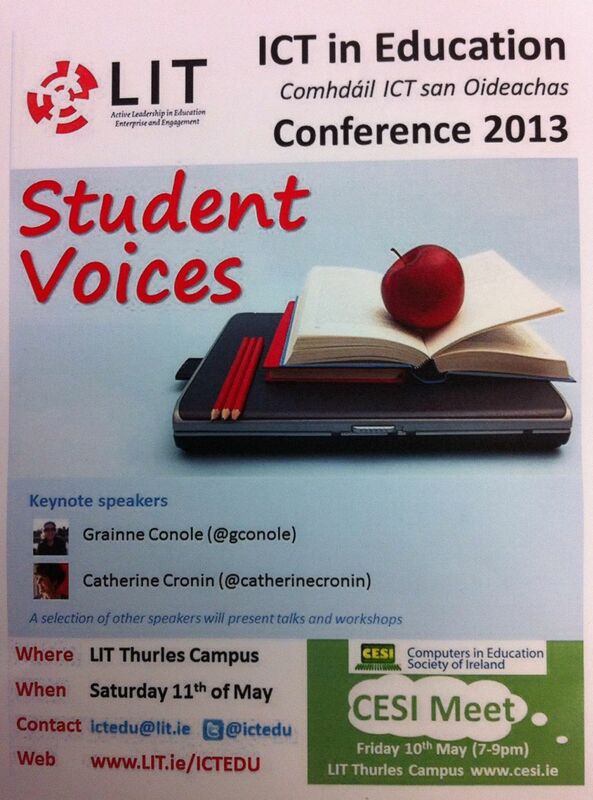 The topic of my keynote will be “Creating Spaces for Student Voices”. For the past few weeks, I have been enjoying working with other educators and students at primary, secondary and third levels to create ways for their student voices to be present. To exist, humanly, is to name the world, to change it. Once named, the world in its turn reappears to the namers as a problem and requires of them a new naming. Human beings are not built in silence, but in word, in work, in action-reflection. Human beings are not built in silence. We delight in the first sounds of babies, the first words of children; we marvel at their acquisition of language. And in classrooms, at all levels of education, what do we ask of growing children and adults? Too often, while we speak, we ask for silence. The architecture of most of our classrooms and lecture halls both reflects and contributes to this. As educators, many of us have rediscovered the power of word, work and action-reflection in our own learning. We speak, we write, we use social media to share and to engage in dialogue. A growing number of educators are inviting students to do the same. Creating opportunities for students to find and share their voices requires openness and a willingness to challenge long-held assumptions and practices – those of our students and institutions as well as ourselves. Catherine will share the voices of students, from all levels of education, as well as her work and the work of other open educators, as she explores ways to create spaces for student voices. If you’ve never participated in the #ICTedu conference, I can only describe it as something special. The conference is a unique opportunity for educators to connect — across sectors and all the usual boundaries — to meet, discuss and share ideas about learning and teaching. I attended the conference for the first time in 2011 where I met Mary Jo Bell who had just started using Twitter with her Junior Infants class; I shared this with my 2nd year BSc students and we exchanged tweets with Mary Jo’s class. I met Simon Lewis and Rozz Lewis, editors of anseo.net, and Damien Quinn, creator of seomraranga.com — all amazing examples of teachers openly sharing their resources and ideas with other educators. I met Mags Amond, dynamo of a secondary teacher and organiser of CESI Meets (Ireland’s own TeachMeets), a teacher of rare wisdom and generosity. In 2012, the ICTedu keynote speakers were Pam Moran and Ira Socol, wonderful human beings and educators with a crystal clear focus on learners, student voice and democracy who are helping others to re-imagine learning spaces. These and many other educators who I’ve met at #ICTedu have helped me to become a better educator and have enriched my life in many ways. As a 3rd level educator working only with others at 3rd level, I realised how narrow my conception of education had become. I interacted with very few teachers from primary, secondary and other sectors — beyond family and friends and the teachers at my children’s schools. Participating in the ICT in Education conference, as well as the annual CESI conference, CESIMeets and #edchatie weekly Twitter chats, has broadened my understanding and helped me to create a rich and diverse Personal Learning Network (including many new friends). All of these educators have helped me to reflect, to learn, and to improve my teaching practices. If you will be attending the ICT in Education conference, I look forward to seeing you there. If you won’t be attending, you’ll have the opportunity to connect via Twitter (#ICTedu) and the live stream. Many thanks to Pam O’Brien and all of the organisers — I’m looking forward to a wonderful event! Reblogged this on ICT in Education Conference blog.